The world renowned orchestra conductor and composer Ennio Morricone will have a concert Tuesday evening in the Bulgarian capital Sofia. Morricone with perform with the orchestra of Classic FM radio. He will be accompanied by singer Susanna Rigacci and guitarist Rocco Zifarelli. Tuesday's concert will be Moriconne's last in 2013 and will bring together more than 200 Bulgarian musicians, Classic FM's choir and orchestra, as well as talented Bulgarian jazz musician Teodosiy Spassov. A week ago, Morricone performed in Chili together with lead singer of alternative metal band 'Faith No More' Mike Patton. Earlier this year the honorary Oscar-winner Ennio Morricone was named European Cinema Composer 2013 by the European Film Academy for his score to GiuseppeTornatore's 'The Best Offer'. On Wednesday, New Bulgarian University is bestowing Maestro Ennio Morricone with Honoris Causa honorary degree. Awarding this title is a sign for distinction and recognition of exceptional individuals. Honoris Causa is a prestigious academic degree, given to prominent persons of world or national significance. Usually it is received by leading scientists, discoverers, inventors, writers, musicians. Ennio Morricone insists that he is unjustly considered as primarily a film music composer, since he has written more than 100 works which he calls 'absolute music intended for musically educated people'. He shared his daily regime which includes going to bed early, waking up at 4 am, exercising and composing in the mornings. 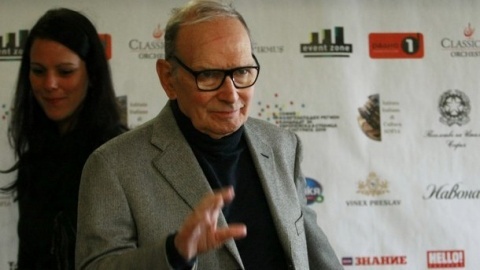 For Bulgarian National Radio Morricone said that although he was 85-years-old, he was young at heart and he still felt the passion and pleasure of composing music. The concert of Ennio Morricone and Classic FM will be held at Sofia's Arena Armeets hall, with ticket prices ranging from BGN 60 to BGN 200.